Maria Taylakova interrupted her series of defeats in the semifinal. In the match for the first place with the score she confidently beat compatriot Valery Shcherbatykh 4:0 (11-3, 11-7, 11-4, 11-8). «Usually, I’m nervous when playing against the girls from my team, but the situation was different today. In this final game with SHCHERBAKOVA I was calm and steady, unlike when I opposed BAJOR in the previous match. Moreover, we played without a coach now, so I had to take my own decisions and play as I decided. It’s the first time that I’ve made it to the finals and through, I’ve never got farther than semifinals before». In the dramatic final of the Men’s Singles, Tomas Polansky overcame Cristian Pletea (Romania) – 4:3 (11-6, 5-11, 12-10, 11-5, 5-11, 7-11, 12-10). Polansky, the first seeded, confidently moved on the tournament. His coach Josef Plachy in the post-match comments noted that the win over Tom Jarvis helped Tomas. The Czech sportsman lost Jarvis in the main draw of the European U21 Championships. Pletea in turn gave out tough matches, conceding at the beginning and catching up at the end. Tomas managed to make a real miracle, winning on the balance 12-10! This victory is even more valuable for the Czech athlete, because he played with a injury. «Before the match, I was in two minds whether I could succeed in the finals with my arm traumatized. I played smoothly but PLETEA surprised me and got some aces from up his sleeve, so I had to change my tactics, I switched to forehand play at 3:1. To be honest, I don’t have a slightest idea of how I managed to prevail in the seventh set. I kept up with my play and hoped for the best. My arm didn’t bother me in quarterfinals and semifinals, and now it reminded me that I had to be careful. Of course, it would also be fantastic if I won Doubles too, but I was focused on Singles from the very beginning». 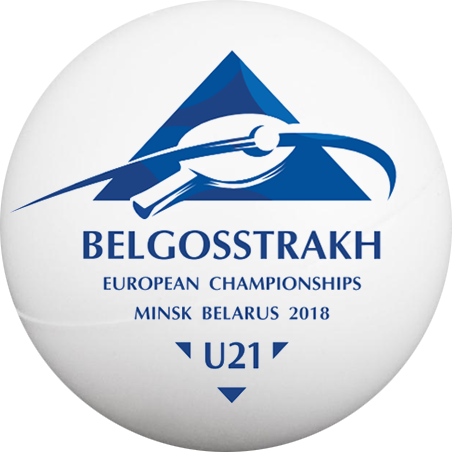 Belgosstrakh European U21 Championships is completed. Thank you for being with us!